This option can selected differently for the score and the parts. Individual alignment gives more vertical space for other objects and works better in narrow part pages. Alignment per system is usually better readable, but requires more space. Bottom (c): Alignment of the text expressions. Rehearsal marks are close to the notes/staff. An "Extra Vertical Collision Offset" can be set here (Default: 5 EVPU). This value is added to all vertical offsets on the expression, articulation and hairpin tab and makes it easier to generally increase the vertical distances of two objects. Don't forget to also adjust the "Below Staff Baseline Position" and/or the "Vertical Entry Offset" on the "Optimize" tab in order to adjust the general placement of dynamics and expressive text. The Silver edition allows six predefined values (-3, 0, 5, 10, 15 or 20 EVPU), while the Gold edition is fully flexible. The "Harmonize Offsets and Aligment of Rehearsal and Tempo Marks" option harmonizes the offsets in the Rehearsal Marks, Tempo Marks and Tempo Alteration categories which improves their horizontal and vertical alignment. The overall vertical alignment of hairpins, dynamics and expressive text on a system is done in a complex algorithm which takes into account many vertical and horizontal positions and distances and tries to create a visually balanced and pleasing look. b.) Smoothen Vertical Alignment of Hairpins and Dynamic Expressions: If selected, the vertical alignment algorithm is run twice. This usually leads to more hairpins and dynamics being on the same vertical position and thus look smoother. In the parts where there is usually more vertical space available and where readability is much improved by dynamics and hairpins being on the same vertical position, it makes sense to align close dynamics also if unconnected and to smoothen the vertical alignment. In the score these options usually are selected the other way round. These are also the default settings. Single dynamics on very low notes are usually not taken into account for overall vertical alignment (see the fff and the ff in image 2 above). Top: All dynamics are aligned, also if unconnected. Bottom: Only those dynamics are aligned that are connected by a hairpin. While dynamics and hairpins and single staves are aligned with a certain distance to the lowest object above them, on two staff groups like in piano notation they are usually centered between the lowest object from above and the highest object from below. As is single staves they still have to be connected to adjacent dynamics/hairpins in a musical and visually balanced way. The Perfect Layout offers vertically staff-centered alignment of dynamics and hairpins in combination with automatic best staff distance calculation. To activate this feature check "Center Dynamics and Hairpins Between Two-Staff Groups". The feature is still in beta state, but already delivers very good results most of the time - even if there is not much vertical space available. In order to avoid collisions of rehearsal marks and measure numbers, you can easily select their placement in "Place Rehearsal Marks at Start of System" and "Place Measure Numbers at Start of System". Of course, it is also possible to keep the original position. Don't forget to uncheck "Hide Measure Numbers" in the rehearsal mark expression to actually see measure numbers next to rehearsal marks. To fine-tune the placement of measure numbers, you can also change the horizontal and vertical offsets at system start manually. By default these values are created automatically ("Automatically Set Measure Number Offsets at Start of System"). To avoid collisions with group brackets, you can check "Extra Vertical Offset for Curved Group Brackets". It moves measure numbers on top of a group bracket slightly upwards and below the bracket slightly downwards. In general it is recommended to use narrow fonts for measure numbers at system start (e.g. 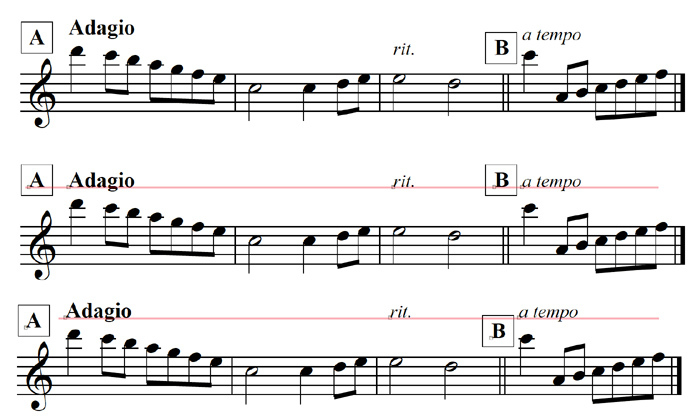 Arial Narrow) - especially when the piece has more than 100 measures (i.e. 3 digits). Other recommended fonts for measure numbers are available here: serif and sans serif fonts. Other options are "At Music Start" and "After Time Signature". Automatical alignment of lyrics in relation to the lowest notes is partially available in the Perfect Layout plugin. Unfortunately the JW Lua plug-in interface doesn't support creating new staff baselines for lyrics. So if a Finale document doesn't have any manually adjusted staff baseline for lyrics, the alignment won't work. Here is the description what you have to do before running the plug-in. The lyrics alignment is rather limited. 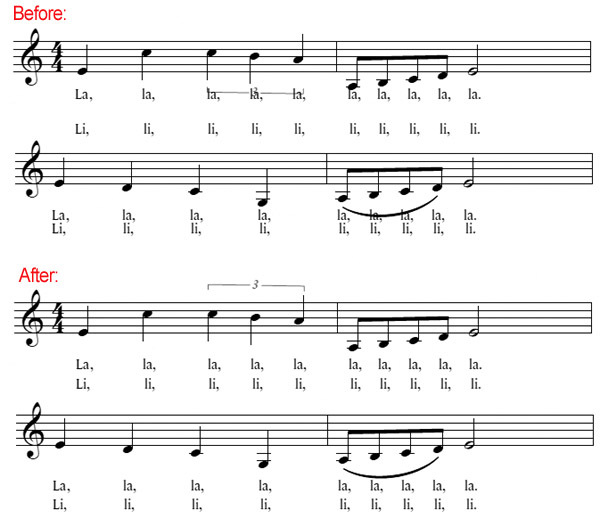 It only takes into account the note bottom positions (including articulation) and fixed offset if a note has a slur. The exact slur data is currently not taken into account which might lead to collisions. Tuplet brackets on lyric staves are automatically moved on top of the staff to avoid collisions (measure 1). In the last measure the slur collision is removed, but the distance to the slur is slightly too small which is a result of the fixed slur offset. This will be fixed in a future release.